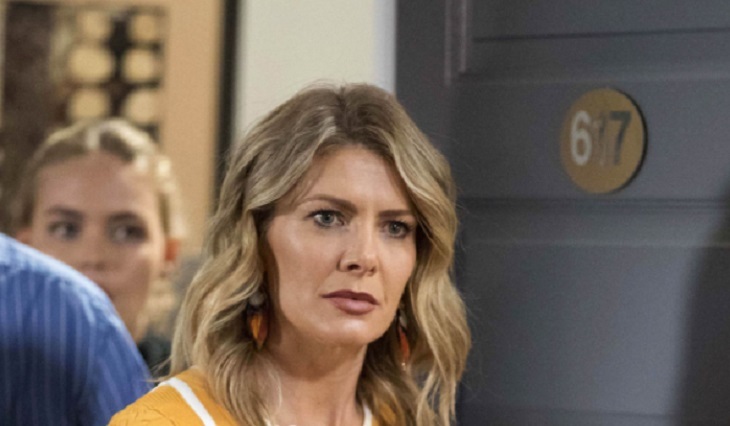 Neighbours spoilers tease that it’s time for Izzy Hoyland to leave Ramsay Street once more – but she’s got one last trick up her sleeve. Susan and Karl shippers will be excited to learn that Izzy’s exit scenes will air next week, but she has a surprise for the Kennedy’s before she leaves. Izzy is forced to tell the Kennedy’s that she stole Karls sperm from the hospital and self-inseminated in an attempt to become pregnant with his baby. Thankfully for Karl and Susan, Izzy is forced to admit that a pregnancy test she takes turns out negative. It’s a relief, but we all know that bad things happen when Izzy Hoyland doesn’t get her own way. However, Neighbours spoilers indicate Izzy then hits Karl with another shock confession: she never really wanted a baby – she just wanted to get close to him again! This plot twist comes right after she successfully convinced everyone she didn’t want to be close to him, but instead just wanted a biological sibling for Holly. She doesn’t just admit it though, she puts it into action; Izzy tries to seduce Karl! Thankfully, Karl is staying loyal to Susan this time and rejects Izzy, heading right back home to his wife to tell her what has happened. For this reason, Susan seeks out advice from Toadie, who tells her to use reverse-psychology to try and beat Izzy at her own game. LOVE NEIGHBOURS? SIGN UP FOR OUR EXCLUSIVE NEWSLETTER! Following his advice, Neighbours spoilers tease Susan suggests that Izzy moves back to Erinsborough full time, living just round the corner from her and Karl, while integrating back into the community. Just as Toadie and Susan wanted, Izzy comes to realise that such a ‘dull’ life isn’t for her, so quickly devises plans to leave Erinsborough again. Even more, Izzy decides that she’s going to leave Holly in Erinsborough with Karl and Susan, believing they are better parents than she could ever be. Will Holly be able to cope without her parents? The Young and the Restless Spoilers Week of March 19: Brutal Family War, Evil Plans, And A Shocking Discovery!